Buyers may select the rows that they wish. Seller will offer free digging with the use of a tree spade, creating approximately a 60” diameter root ball. Seller will assist in loading loading palms onto your truck. Digging and loading must happen on the same day. Since the palms slightly varry in height, the price shall be determined by the total trunk feet per row. Average trunk height (ground level to the base of the newest spike) per palm is approximately 2.5 feet. Price is $450.00 per trunk foot. 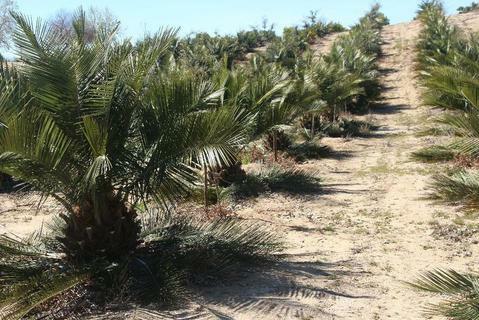 There are 13 rows of 5 palms available. You may arrange to tag your row/rows of 5 palms while they last. Grove is in Temecula, CA. Contact Keith Huber at Palm and Cycad Exchange at 760-525-5148 for an appointment to view. ​ For a copy of this information to print CLICK HERE.